Polly loved sharing plant information with friends and visitors so it is only appropriate that a portion of her former home has been transformed into our Member Library. The library is opened to members by appointment. Our collection includes books from Polly’s personal collection and former Executive Director Steve Spongberg’s donation of botanical, horticultural, and natural science books and journals. These publications cover a range of plant-related topics including horticulture, gardening, plant taxonomy, garden design, botany, and plant lore and legend. Our library also houses some rare horticultural books not to be found elsewhere on the Vineyard. In addition we continue to acquire current selections of horticultural books and periodicals. 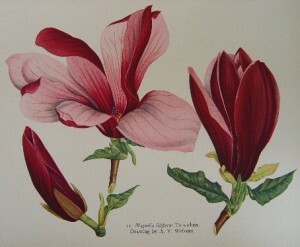 Plate of the lily magnolia, Magnolia liliiflora, from the book Asiatic Magnolias in Cultivation (1955) in our library collection. Over the years we have accumulated a large collection of Polly’s files including her correspondence, plant notes and research, and a great deal of articles written by or about Polly. Many of these files contain documents of significance to PHA as they provide a glimpse into Polly’s work and her vision for the property. 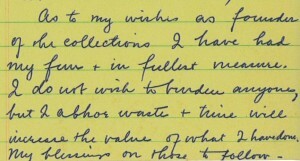 The excerpt below, taken from a note written in 1971, is one example. Due to the historical value of this collection, we have been working on a project to organize Polly’s files into a proper archival collection. With the help of volunteers we have begun to survey the files and transfer the documents to new acid-free folders to be stored in acid-free archival boxes. The file is given a name reflecting the box number it is to be housed in, along with the identifying subject, such as Box 1, Azaleas. The final piece is to put together an index to the files – called a Finding Aid, which will be stored in a computer file. 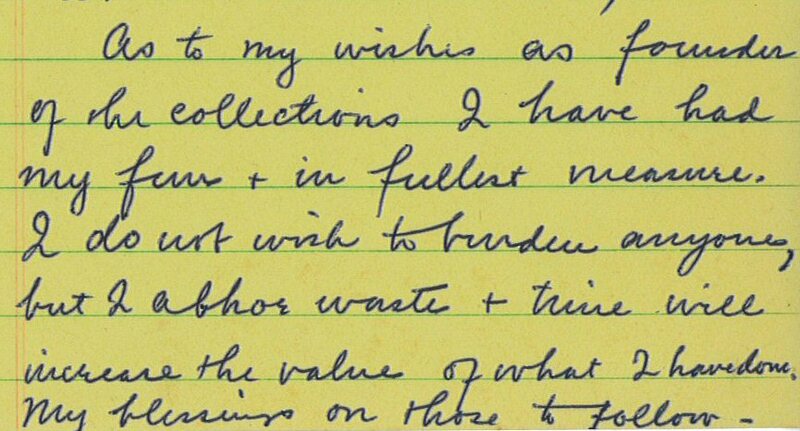 The ultimate goal is to organize the collection in a manner that makes them accessible and searchable by subject. This is an on-going project and an enjoyable one. It is nice to spend a dark winter’s day in the cozy library reading over Polly’s papers. You never know what gems you may find.